Ya' know what folks, I think I'm actually starting to like Mera MORE than Aquaman. 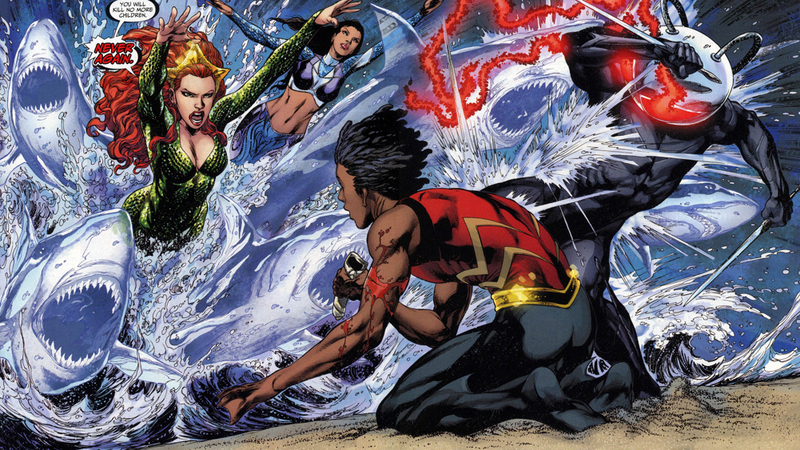 Case in point, Brightest Day #20 struck last week and while it drowns in Aqua-goodness (and features the long awaited inclusion of Aquagirl) Mera just kicked arse from the moment she roared onto the scene with her squad of angry water-sharks. Yip, water-sharks - defining 'cool' in Brightest Day #20 - out now. I think he has too much on his plate. Glad you like her more Dan, because she might be around more time than him. I like them but, following my bad joke from the other day, he should take better care of his body. Thanks ladies - yes it definitely seems to be the case Mera's been set up for something big. Maybe she will join the next JLA intake over her iconic husband? Someone has to. You know that one behind a good fish man, there's always a great fish woman.